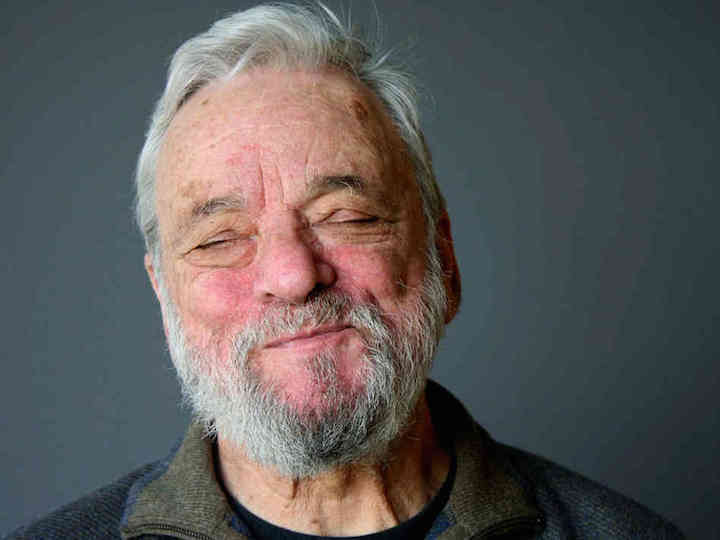 The modern musical and theatrical retellings by Stephen Sondheim (below) of well-known childhood fairy tales do not offer your usual versions of Little Red Riding Hood, Prince Charming, Cinderella and Rapunzel among others. It involves both the University Opera and the University Theatre and Drama Department. 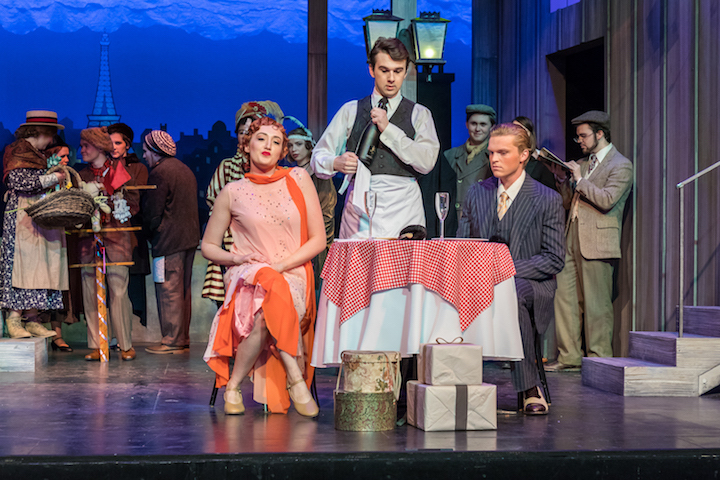 The ambitious joint production – the first in a dozen years – took almost two years and involves over 90 people. 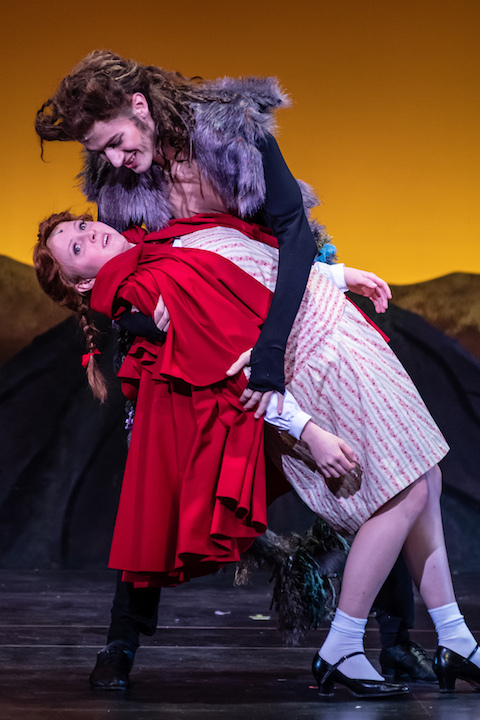 You can see the promising results for yourself in five performances starting this Thursday night in Shannon Hall at the Wisconsin Union Theater. Performances are at 7:30 p.m. on Thursday, Friday and Saturday nights; and at 2 p.m. on Saturday and Sunday. Happily, there are a lot of ways to check out background and prepare for the show, which faced its own trials. 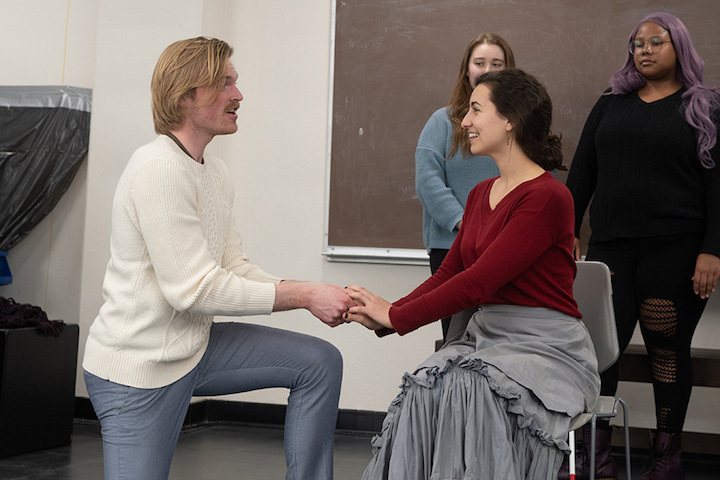 You’ll notice, for example, that the rehearsal picture below — taken by Beau Meyer of Elisheva Pront (Cinderella) with Jake Elfner (her Prince Charming) — was taken with no costumes, even though such photos were planned. But during the recent deep freeze and big thaw, Vilas Hall got hit with flooding from broken pipes and the costumes got clobbered, so such photos are delayed. Still, the show must go on — and did. 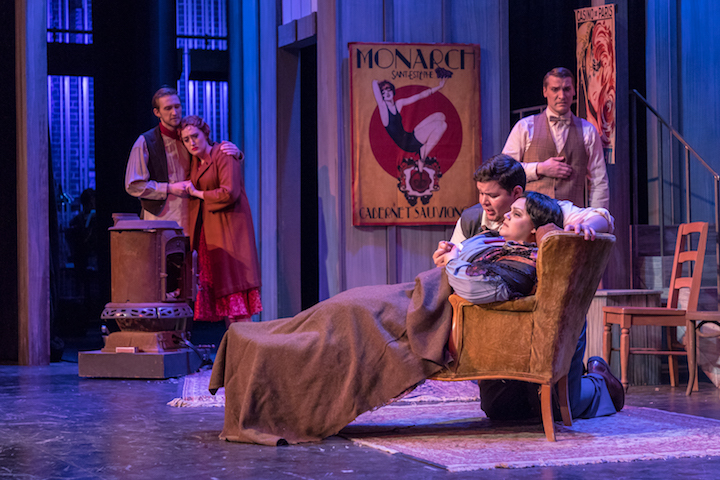 Classical music: University Opera will stage three performances of “Transformations” this Friday night, Sunday afternoon and next Tuesday night. 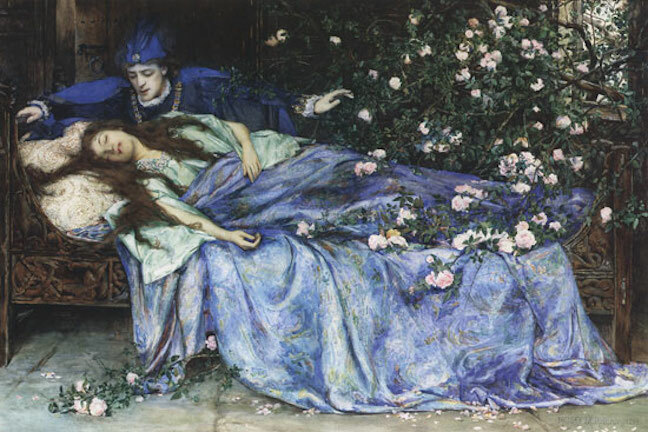 Take children’s fairy tales – such as “Sleeping Beauty” (below) — and recast them through adult reinterpretations. You can get some pretty weird and dark and humorous results. It also worked for the Pulitzer Prize-winning American poet Anne Sexton, who grew depressed and killed herself at age 45. Her versions then became an opera. 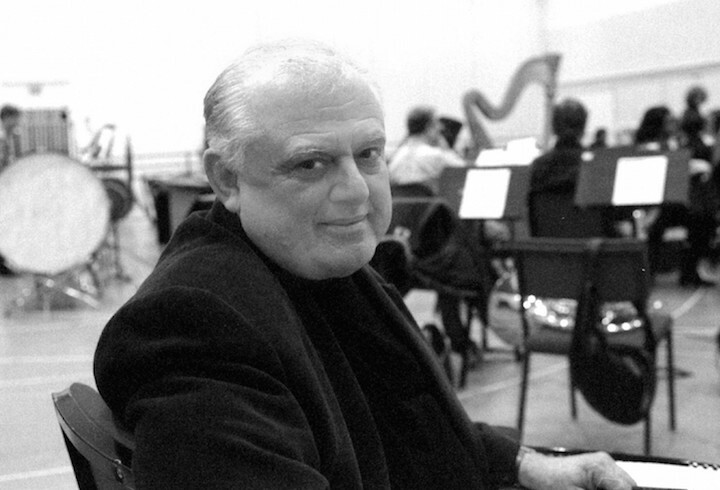 The music, described as tonal and accessible, is by Conrad Susa (below), who taught at the San Francisco Conservatory of Music. 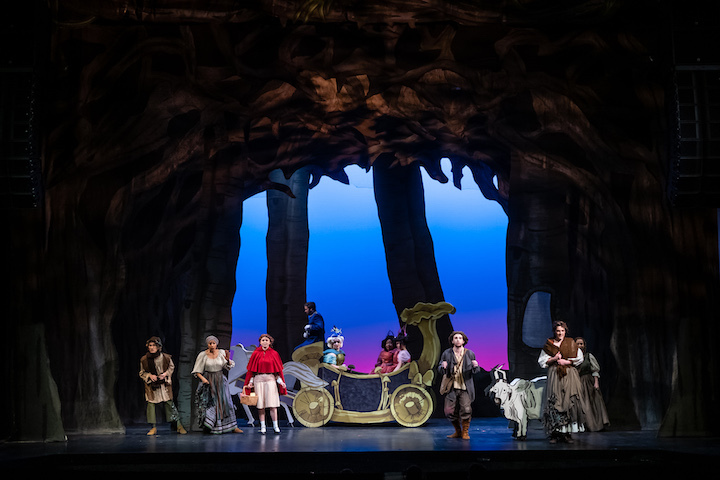 The contemporary opera has been popular and widely staged. Admission is $25, $20 for seniors and $10 for students. 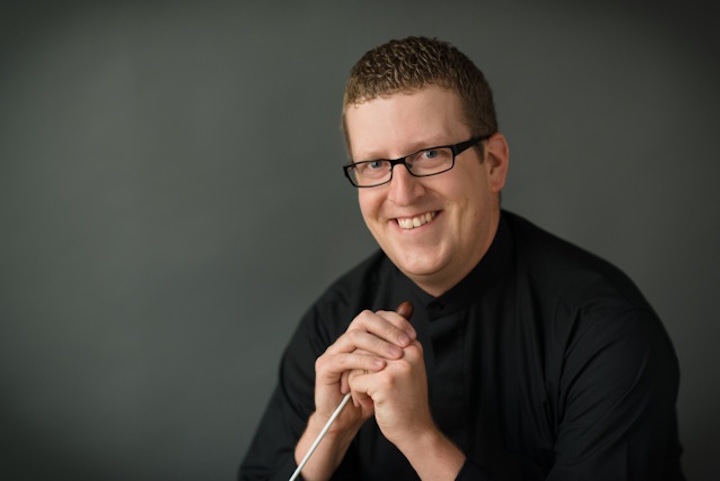 The music director is graduate student in conducting Kyle Knox (below), who recently conducted Mark Adamo’s “Little Women” for the Madison Opera and who conducts ensembles at the UW-Madison and the Middleton Community Orchestra. 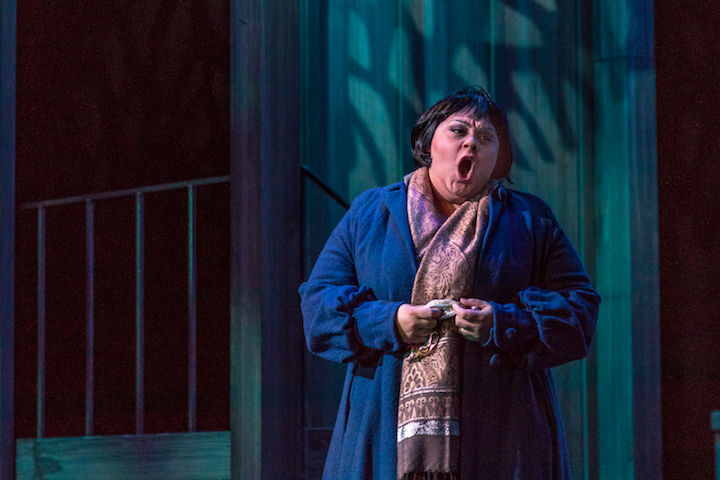 Classical music: Stage Director Norma Saldivar talks about Stephen Sondheim’s “Sweeney Todd.” The Madison Opera gives three performances of it this coming weekend. 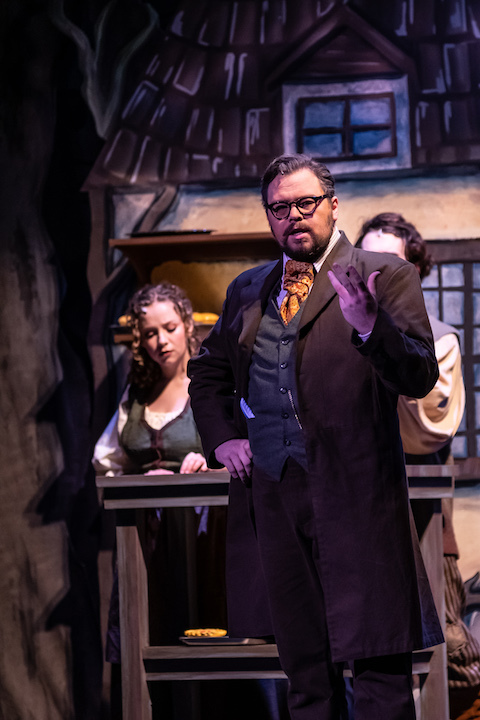 The Madison Opera will present its first-ever production of “Sweeney Todd: The Demon Barber of Fleet Street” by Stephen Sondheim (below) this coming weekend on Friday and Saturday nights and on Sunday afternoon in the Capitol Theater at the Overture Center for the Arts. The company has built a new production of this American masterpiece — which is so popular that it was made into a 2007 film by director Tim Burton that starred Johnny Depp, Alan Rickman and Helena Bonham Carter. 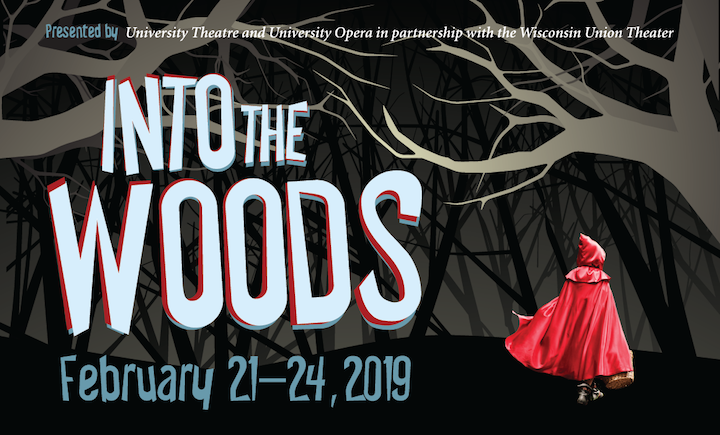 The powerhouse cast, Madison Opera Chorus and the Madison Symphony Orchestra all promise to bring a very operatic theater score to life. The show tells of the barber Sweeney Todd, who returns to the gas-lit streets of Victorian London after 15 years of unjust imprisonment to claim vengeance on those who wronged him. He is aided in his murderous activities by Mrs. Lovett, maker of some rather tasty meat pies. One of Sondheim’s most renowned works, “Sweeney Todd” has a stunningly inventive score containing drama, macabre humor, lyrical purity and an unforgettable final scene. 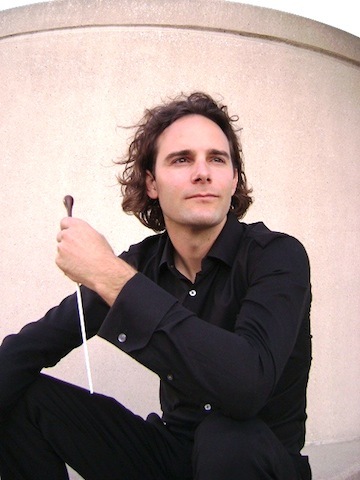 That first Houston Grand Opera production was conducted by John DeMain (below, in a photo by Prasad), the music director of the Madison Symphony Orchestra and the artistic director of the Madison Opera, who will conduct these performances. 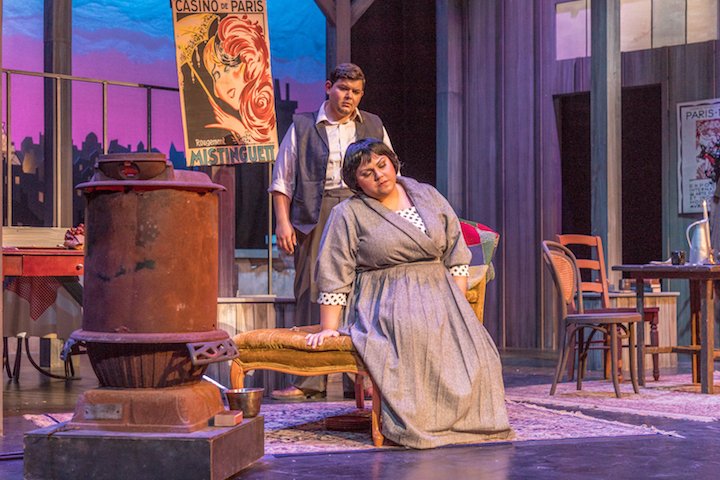 Corey Crider (below top) and Meredith Arwady (below bottom) make their Madison Opera debuts as the vengeful barber and the ever-practical Mrs. Lovett. 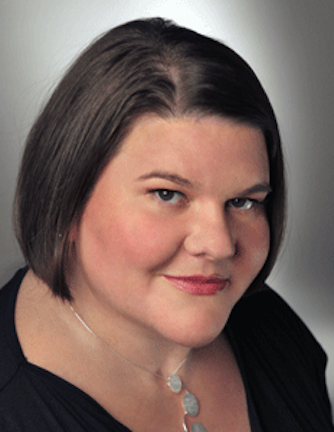 Crider has sung leading roles with Lyric Opera of Chicago, Arizona Opera, and the Castleton Festival. 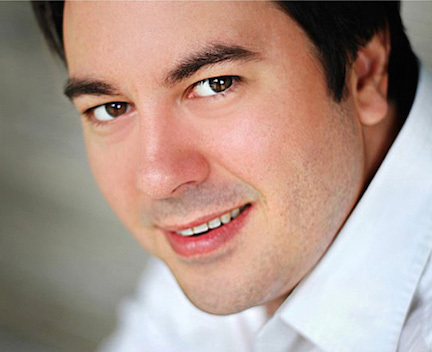 Arwady has sung leading roles with San Francisco Opera, the Metropolitan Opera, Houston Grand Opera, and Santa Fe Opera. 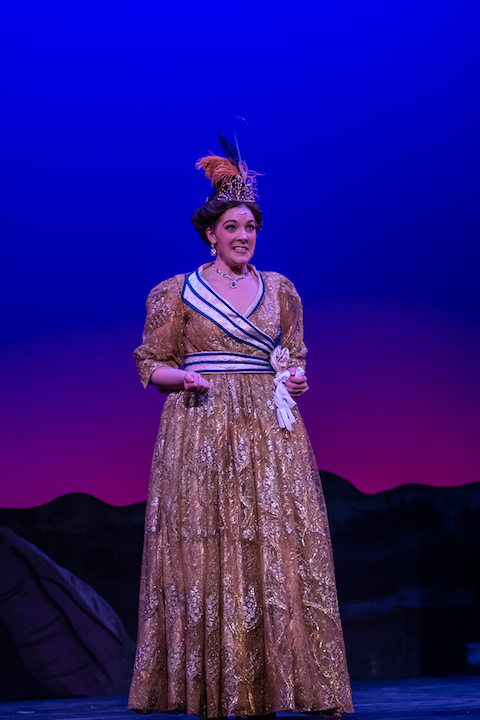 In the role of the mysterious Beggar Woman, Emily Pulley (below) makes her Madison Opera debut after recent performances at the Metropolitan Opera, Central City Opera, and Opera Theater of St. Louis. 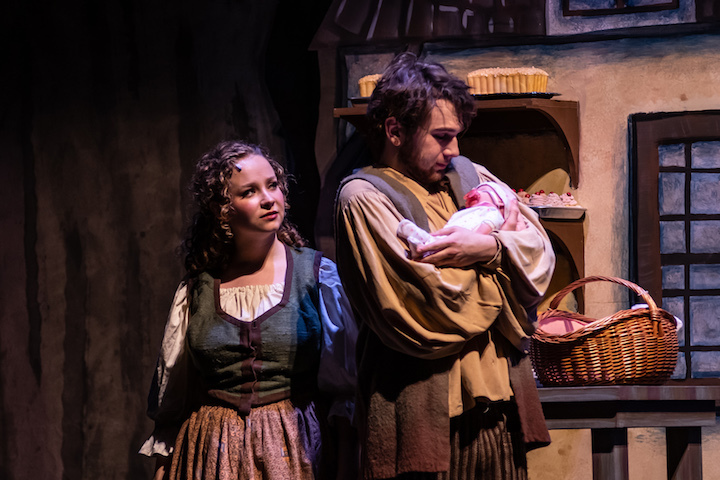 Returning to Madison Opera are former Madison Opera Studio Artist Jeni Houser as Johanna, Sweeney’s daughter; Daniel Shirley as the young sailor Anthony Hope; and Thomas Forde as the evil Judge Turpin. Three tenors round out the cast. Joshua Sanders, who has been singing with Madison Opera since high school, plays the innocent Tobias Ragg. Jared Rogers makes his debut as the menacing Beadle Bamford. Robert Goderich, a local theater and opera favorite, plays Sweeney’s rival barber, Adolfo Pirelli. 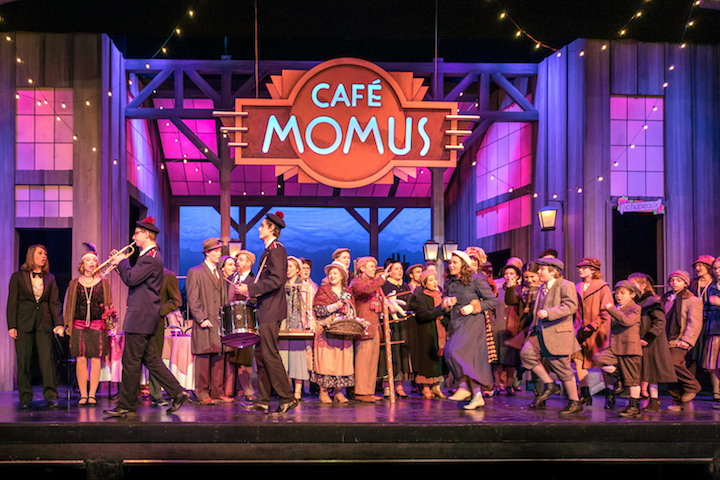 Performances are on Friday, at 8 p.m.; Saturday at 8 p.m. and Sunday at 2:30 p.m. in the Capitol Theater of the Overture Center. The production will be sung in English with projected text. 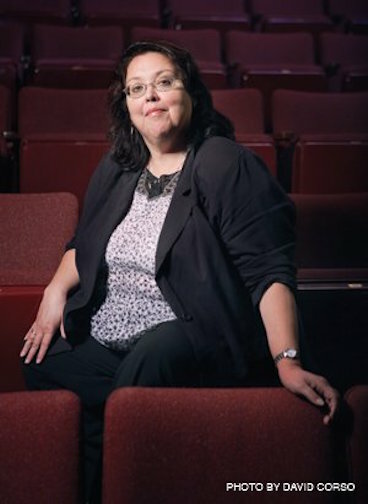 Madison Opera is building a new production specifically for the Capitol Theater. Stage director Norma Saldivar, set designer Joseph Varga, costume designer Karen Brown-Larimore, and lighting designer Hideaki Tsutsui are creating a world set in an Industrial Age factory, with the orchestra on stage to bring the action even closer to the audience. Could you briefly introduce yourself to readers? 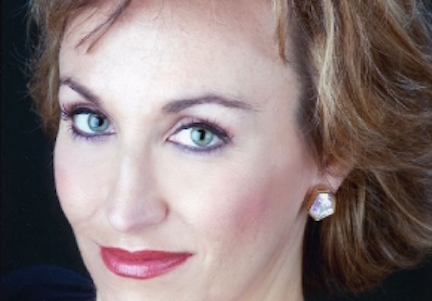 How does directing an opera differ from directing a play? 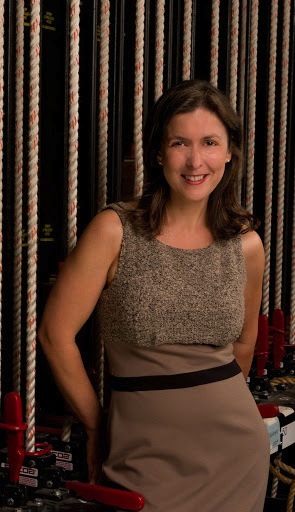 I know that you’d like me to say that there is some real difference in directing opera or straight theatre productions – and there are distinct differences. 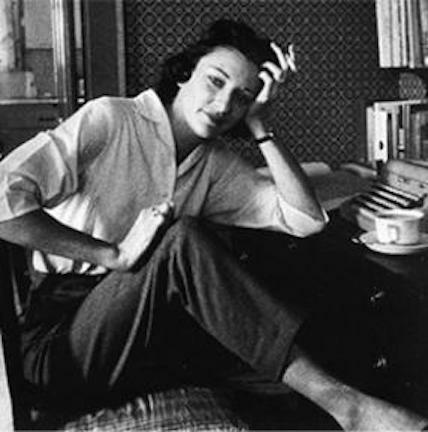 However, the work of the director remains the same. 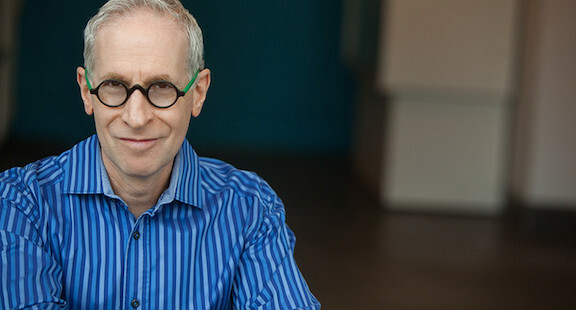 I am a storyteller, a chief creative leader of a team of people who bring the story to life and three-dimensional form. There are differences in working with music that obviously involve expressing the intention of the composer, which means working with a conductor who brings to life and secures the intention of the composer and lyricist. But ultimately, we all work to bring the story to an audience and to engage and entertain them. In the case of “Sweeney Todd,” how does such a grim and gory or grotesque plot – about murdering men by slitting their throats and then baking their bodies into cannibalistic meat pies –- end up being an enjoyable and entertaining opera? Does being so over the top help or offer special challenges? 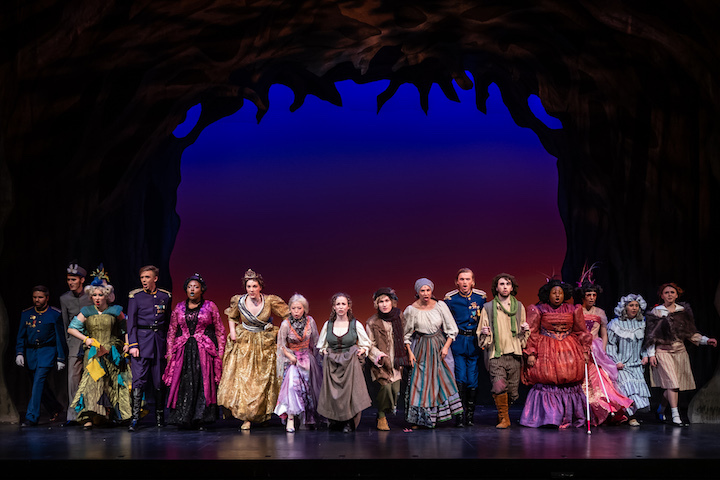 The story predates Sondheim and began in “penny dreadfuls” — these stories of suspense were very popular and connected to their audience in a way that so many contemporary suspense and horror stories do now for our audience. I think there is a great deal of suspense in the story, in that as it unfolds an audience can’t believe their eyes or ears. The audaciousness is surprising and tantalizing –- and then there is also humor, heartbreak and love in the story. It is a different take on an age-old story of revenge. 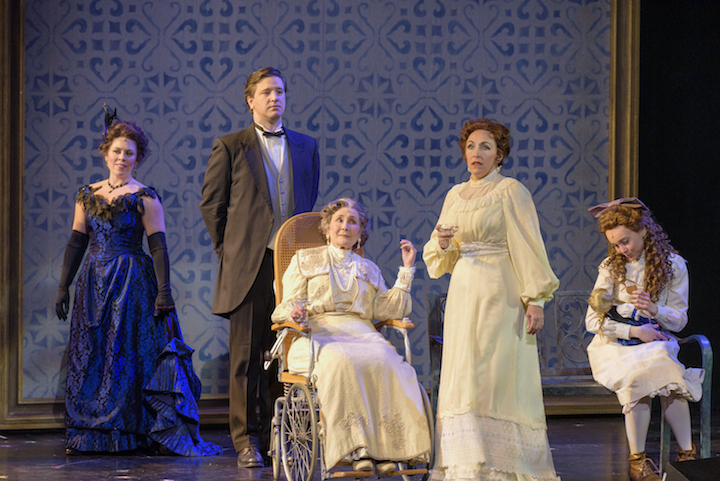 What does Stephen Sondheim do in the libretto and music to overcome that kind of inherent handicap? I don’t see the aspects of the genre — suspense and horror – as handicaps. 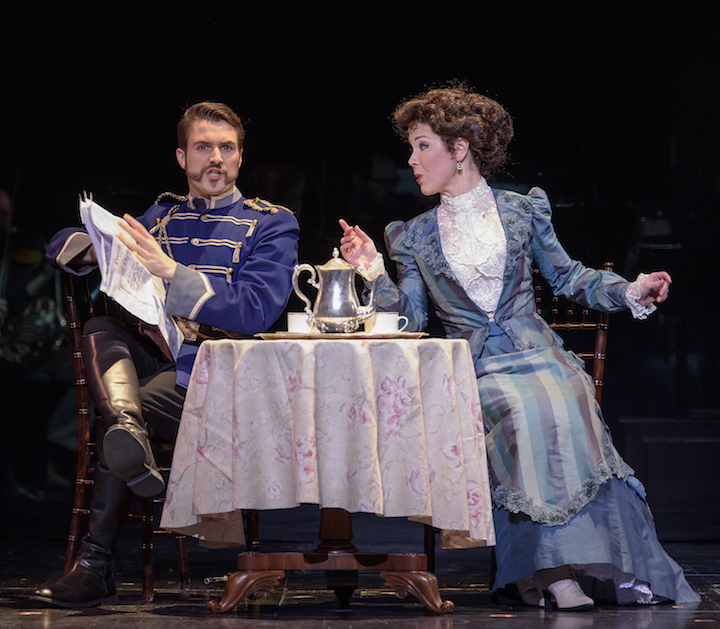 There are other musical pieces – “Phantom of the Opera” is one – that make for great drama. The music is the added character to the story. 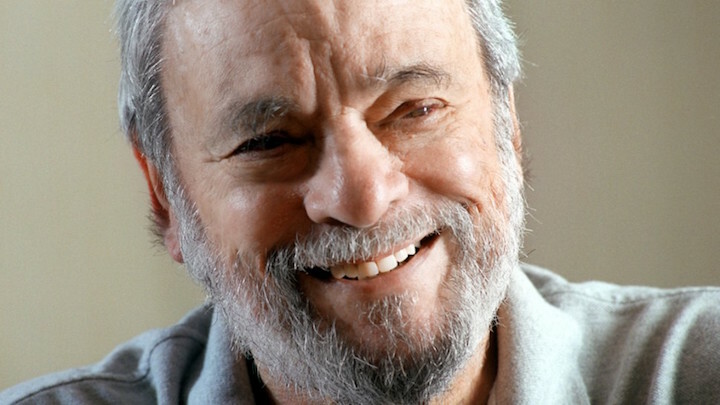 Sondheim writes in one of his books that he was inspired by the movie music of Bernard Hermann – his work in horror films by Alfred Hitchcock fueled Sondheim’s work on Sweeney. But Sondheim is so brilliant that he integrates other musical genres in the piece to create a very specific effect. There are intricate pieces that pull us momentarily away from the suspense. Like any good storyteller, his music takes the audience on an unexpected ride. What is your approach to staging it? Are there special things in this production that you would like the audience to take notice of? I am a very visual director. I love that Sondheim himself talks about this piece being a movie for the stage. What a great challenge for the stage director to try and interpret quick cuts and split screens, or changes in time and location on stage. We have a great design team that provides me the tools and background to work with the singers to support the musical story and to work in visual harmony. Without the design team and singers — well, I wouldn’t have much. The challenge with this piece in particular is the length of the story. It moves quickly, spans months of time, and exists in a theatrical and psychological platform all at once. It’s a terrific challenge for a director, production team and performers. All the nuances that have to play to make the story clear is what makes the challenge really interesting. 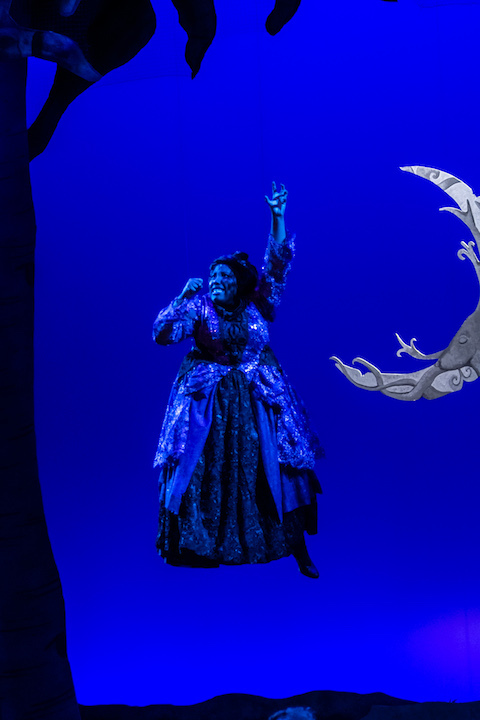 Is there anything else you would like to add or say about this work and this production of it — the cast, the sets, the costumes — for The Madison Opera? 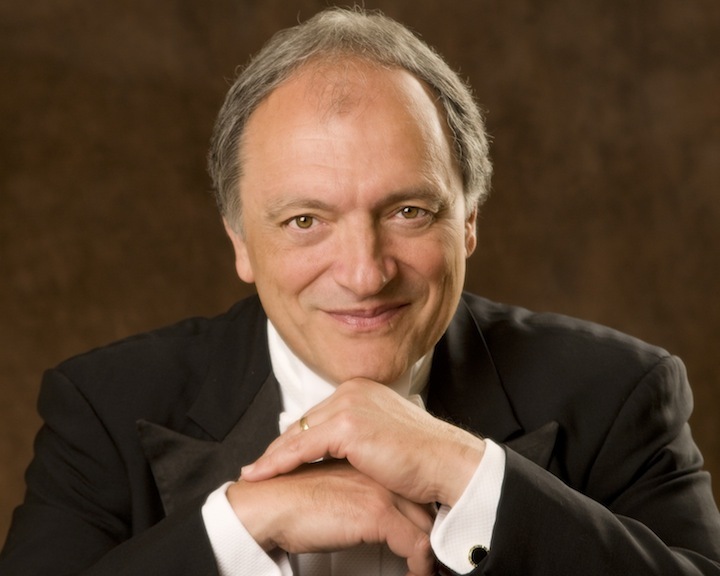 It has been a pleasure to work with the extraordinary John DeMain and the entire Madison Opera family. From the administration to the designers to the principal artists to the lovely chorus to the folks building the show — what more can a director ask for? Everyone is top-notch and devoted to giving everyone the best show. I feel honored to be working with them — really honored.